It’s craft time again! Today I want to share with you three super easy ways to dress up a blank greeting card. Many of us have these blank cards laying around, in the office desk or craft cabinet, that we meant to fill in and send but just never got around to. Well, summer is the perfect time to pull out the art supplies, add a personal touch to one of those blank cards, and send a thoughtful note to someone you love. These three techniques take mere seconds but will add color and life to a blank surfece. And best of all, any one can pull these off! 1. Tape it! 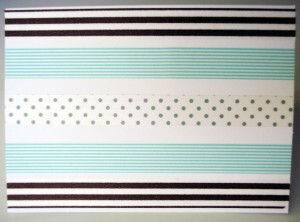 That’s right, simply take some decorative tape (I love these japanese washi tapes from cutetape.com) and create stripes across the front of your blank card. Vertical or horizontal, straight or diagonal, any way you like. I think these simple stripes have a perfect preppy look. 2. Spray it! This one is so easy and can be personalized in so many ways. Use that leftover spray paint you have in your garage and find something in your home to create a stencil from. Almost ANYthing will work for this- lace, material, feathers, buttons, leaves, old toys, jewelry, and for mine I used an old paper doily leftover from Valentine’s Day. 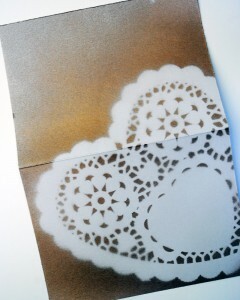 So dig through the junk drawer or cabinets and find those little trinkets that would make a great stencil. Make sure it is something flat enough to create a strong silhouette and do this one OUTSIDE! 3. Paint it! 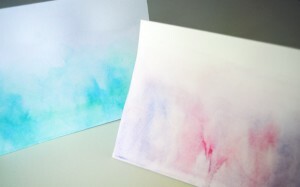 For a sophisticated card that looks so much more expensive than it is, go for a watercolor wash. Use your child’s basic set of watercolor paints to create a gorgeous abstract texture. The trick here is to let the paint do the work and not try to be too in control. Make sure you have a thick paper card for this one and follow these easy steps: First wet the surface of the card with clean, plain water. Then wet your paints enough that your brush gets really saturated with color. Simply drop the brush down on the card’s surface and let the water do the rest- it will move the paint around the surface. Add another color (preferably one close to the first so that they will match) and let the water and paint mix across the surface for a marbled effect. You can even lift the card and tilt it back and forth to create the desired effect with your paint. Let these dry flat and you will have an elegant card full of sophisticated Southern style! Do these with a friend or loved one for an even better time and then send off to someone who needs a greeting! All photos by Kat, 2011.